The rain is back; well I suppose it is a bank holiday. Eventually we give up sheltering from it and take the tent down in the rain. The rain turns out to be not as bad as it sounds once you’re out in it but it was a good excuse for a lie in. Then we head off to find breakfast. Everywhere seems shut; well I suppose it is a bank holiday. Eventually we have breakfast at around 1pm in a branch of Booths in Garstang. Then home to catch up with the Vuelta and the Lance Armstrong saga. I don't like Lance Armstrong and I don't think he's innocence. I mean how could anybody defeat all the top cyclists in the world, for seven years in a row, and not only defeat them but also defeat all the top performance enhancing drugs in the world that these top cyclists have pretty much all freely admitted (eventually) that they were on. 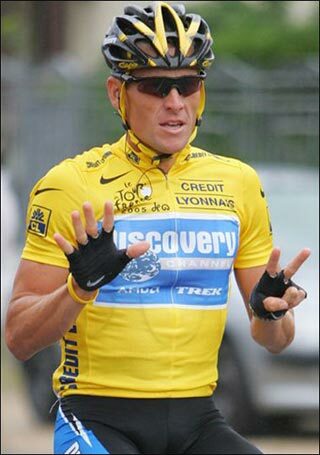 Drugs or not, Armstrong was still the best rider in those races because he won on a playing field levelled by those drugs. I suppose it’s possible, but unlikely, that he had better drugs than the others. Maybe he was just the better athlete. Sure it's frustrating for anybody who was clean but reality means they almost certainly finished well outside the top twenty. Stripping him of his seven titles is just pointless. Who does that leave as winners of those Tours? The confessed dopers Jan Ulrich, Alex Zulle, Joseba Beloki and Ivan Basso, that’s who. Along with the deeply suspicious Andreas Kloden. It’s time to draw a line under this all this and move on. As Armstrong says, it’s now simply a witch-hunt. This is all ancient history. We have new heroes now.